Vitamin B12, also known as cobalamin, helps the body form red blood cells, produce cellular energy and create DNA. Most people need just a few micrograms (between 2.4 and 2.8) of this vitamin each day. Despite the tiny amount, consumption of this nutrient is essential for good health. You can obtain this essential nutrient from a range of foods, including animal products, fortified grains, fermented plants and sea vegetables. Vegetables and grains aren't generally a good source of vitamin B12. But you may be able to get more B12 by adding sea vegetables, certain types of mushrooms and fortified grains to your daily diet. Vitamin B12 is a water-soluble nutrient synthesized by microorganisms and found naturally in a variety of foods, primarily in animal products. Foods like fish, shellfish and meat products are the types of foods that are well-known for having high levels of naturally occurring vitamin B12. Vegan- and vegetarian-friendly vitamin B12 is less readily available than that in animal products. Vegetarian-friendly foods like eggs and milk products are considered good sources of vitamin B12. Vegan-friendly sources of vitamin B12 are typically fortified grains and cereals, though vegetables with vitamin B12 also exist. Vitamin B12 and vegan or vegetarian foods aren’t usually discussed together. However, there are actually a variety of vegan/vegetarian foods with vitamin B12. These foods are often fortified, but may also be naturally occurring. Cereals like wheat, maize, millet and oats contain a variety of nutrients, including protein, calcium, iron, thiamine, riboflavin and niacin. However, there is no naturally occurring vitamin B12 in these foods. Despite this, many cereal products contain vitamin B12 — through fortification. In the United States, breakfast cereals are one of the most common sources of vitamin B12. According to the USDA Food Composition Database, breakfast cereals can contain as much as 9.67 micrograms of vitamin B12 for every 100 grams of food. The cereals with the highest B12 content include Honey Bunches of Oats, Malt-O-Meal, Cheerios, Golden Crisp and Fruity Pebbles. In general, fortification of grains and cereals is thought to be positive, as it helps people easily attain their recommended daily allowances of several nutrients. However, there is some concern that certain foods may be excessively fortified. This means that products across the world are often fortified in different ways. Always look at the nutrient to serving size ratio to understand the quantities of vitamins you’re obtaining. Vegetables can have vitamin B12, although most plants don’t need this nutrient and consequently don’t produce it. This includes common vegetables like broccoli, asparagus, and mung bean sprouts and rarer items of produce, like Japanese butterbur, tassa jute and water shield. However, the levels of vitamin B12 in these vegetables are only trace amounts. 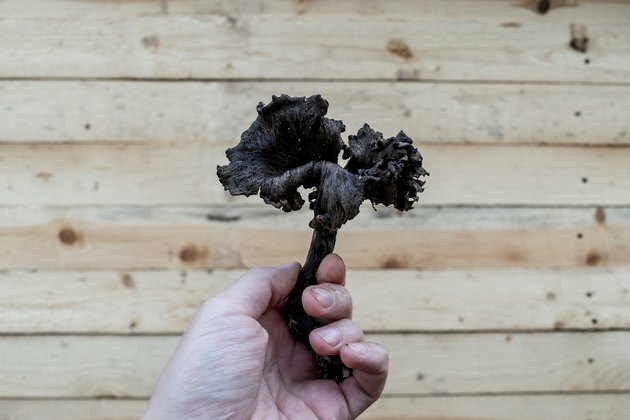 Certain mushrooms, like black trumpet mushrooms and golden chanterelle mushrooms, contain high naturally occurring levels of vitamin B12. These levels are approximately 1.09 to 2.65 micrograms of vitamin B12 for every 100 grams of dried mushrooms. Shitake mushrooms have particularly high levels of B12, averaging 5.61 micrograms per 100 grams of mushrooms, which means that just 50 grams of these dried mushrooms could provide adults with their recommended daily allowance of vitamin B12. Certain types of sea vegetables, like algae such as green laver and purple laver (the most widely consumed types of edible algae), are rich in vitamin B12. Green laver contains about 63.6 micrograms of B12 per 100 grams, while purple laver contains about 32.3 micrograms for the equivalent weight. Notably, the vitamin B12 levels in laver and other types of algae can be influenced by factors like cooking and seasoning. Other types of algae, including red algae (like purple laver) and different species of green algae (like Chlorella_, which is used in supplements), contain vitamin B12 in highly variable amounts. Red algae have anywhere from 2.8 to 60.2 micrograms of B12 for every 100 grams of the food. Green algae like _Chlorella can have essentially no vitamin B12 or as much as 415 micrograms of B12 per 100 grams. Other sea vegetables also act as noteworthy sources of vitamin B12. Vegetables like sea buckthorn berries, sidea couch grass and elecampane all have vitamin B12. Anywhere from 11 to 37 micrograms of B12 per 100 grams may exist in these plants. According to a 2018 study in the Journal of Experimental Biology and Medicine, sea vegetables like these are believed to exist symbiotically with the microorganisms that produce this nutrient. Only microorganisms are able to produce vitamin B12, but this means that foods with microorganisms — like yogurt and fermented vegetables, like kimchi and sauerkraut, contain substantial amounts of this nutrient. Fermented foods like tempeh, natto, sauerkraut, fermented tea and kimchi all contain vitamin B12. The vitamin B12 levels in these fermented foods can vary substantially, however. For example, tempeh contains 0.7 to 0.8 microgram per 100 grams of food, but other soy products that are fermented don’t have values nearly that high. Similarly, foods like kimchi contain relatively trace amounts (about 0.1 microgram per 100 grams). However, according to both a 2014 study and a 2016 study in the journal Nutrients, it is possible to enrich vitamin B12 content in fermented vegetable products using lactic acid or propionic bacteria. Many foods like these are more popular in Asian or Eastern European cultures. However, with the growing body of research regarding the importance of the gut-brain axis, these foods are becoming increasingly popular. This may mean that fermented vitamin B12 foods may soon become more accessible and affordable in Western societies. Vitamin B12 can be found in plants when they are grown using organic fertilizers or hydroponics. Several different methods exist that can increase the nutritive value of vegetables. These plants would otherwise be low in B12. According to a 2014 study in the journal Nutrients, vitamin B12 in spinach increased substantially when these plants were grown using fertilizers such as cow manure. These methods provide an easy, affordable solution to enriching vegetables with nutrients. However, based on current methods, this vegetable alone would be insufficient to provide vegan dieters with their complete recommended daily allowance of vitamin B12. Plants can also be grown using methods that enrich their levels of vitamin B12. These enriched produce items can help vegans meet their vitamin B12 recommended daily allowances, unlike plants grown using organic fertilizers. Such products are not yet easily available to the public, but may be in the near future. You may be wondering why vitamin B12 is of so much interest and why people are continually looking for alternative ways to enrich plants with this nutrient. Vitamin B12 is critically important, as it helps keep the body’s nerve and blood cells healthy. It helps make DNA, the genetic material found within all of the body’s cells. Notably, vitamin B12 is not the same in natural and supplemented form. Vitamin B12 found in vegetables, dairy and meat products is processed differently from synthetic vitamin B12. Just over half of every microgram of natural vitamin B12 is absorbed by the body, but only about 2 percent of this vitamin is absorbed when taken in supplement form. In order for the body to take up vitamin B12, hydrochloric acid in the stomach must separate B12 from the protein in food to which it's attached. Vitamin B12 then combines with intrinsic factor, a glycoprotein in the stomach, that allows for the absorption of this nutrient. Synthetic B12 doesn't need to go through the first stage of this process as it’s already free and doesn’t require the initial separation. Intrinsic factor and the second step are the most critical aspect related to absorbing this nutrient. Without sufficient quantities of vitamin B12, people may experience a wide variety of issues. This includes problems with coordination, mental health or soreness of the mouth and tongue. Certain people also have issues with the production of intrinsic factor, which means that they cannot absorb vitamin B12. Issues of this type can result in pernicious anemia, or Biermer’s disease. Along with people who have trouble producing intrinsic factor, people who are vegan, vegetarian or avoid meat products are considered likely to be B12 deficient. B12 deficiency symptoms include issues with memory and mental health, such as confusion and depression. B12 deficiency is also known for causing problems with oral health, including a swollen, beefy tongue, burning sensations, discolorations and lesions throughout the mouth. It’s easier than you might think to become B12 deficient. This is because the vitamin is water soluble, which means it’s excreted in the urine. Consequently, people need to consume it on a daily basis. If you believe you're vitamin B12 deficient, you should consult your doctor before starting any supplements so that you take the right amount. If your symptoms are particularly severe, you might require very large supplements. You may also be prescribed high doses of this vitamin that are injected, rather than swallowed. Correcting B12 deficiency is easy enough, fortunately. Supplements are readily available, and high doses of this nutrient have been clinically recommended for many years. Multiple recent studies, including a 2018 study in the Cochrane Database of Systematic Reviews and 2017 study in the American Family Physician Journal, showed that doses between 1,000 and 2,000 micrograms of vitamin B12 are a safe and effective way to treat symptoms of B12 deficiency. Such large supplements are also able to resolve complex issues, like anemia and neurological symptoms. Despite the ease of correcting this deficiency with supplements, it’s always best to try to obtain all of your nutrients naturally from the food you eat, as deficiencies may have long-term negative effects. If you’re adhering to a vegan diet or avoiding animal products, try to focus on consuming fortified foods, like breakfast cereals, every morning. Alternatively, incorporate foods that contain large amounts of vitamin B12, like algae and mushrooms, into your daily meals. Which Plants Provide Vitamin B-12?